It’s a go. Gilberto Ramirez, the undefeated 24-year-old boxer from Mazatlán, Mexico, is set to challenge Arthur Abraham at the MGM Grand in Las Vegas on April 9 for the super middleweight title. It won’t be easy: Abraham, an Armenian-German, is a formidable opponent. Technically skilled, he is tough, with a strong punch. It is clear that the boys from Mexico are serious contenders. At the gym in Mazatlán I watched as Ramirez – called “Zurdo” or “Lefty” – was taken around the ring with weights on his ankles by Jose Luis Cruz, a former world-ranked middleweight. Cruz was a solid opponent, but this was boxing school, not proper sparring. For that, the team needed to be Stateside. Hector Zapari – Jesus’ son and Ramirez’ trainer – was following Ramirez as he ducked the cross-wires, adding technical advice when needed. I was holding a large audio recording device, which I put away. Instead, I switched to taking notes. As the two men trained, the pace picked up. Some sweat flew into my ink. Ramirez, in blue headgear and red gloves, was light on his feet, despite the weights. Cruz – red headgear, black gloves – was more dogged, as if he’d have liked to get in there, if only he could. “What are you writing?” asked Jesus. “I am just describing things,” I said. “No spies, please,” he said, wagging his finger. It was a soft push. This is a family business, and the Zaparis run a low-key gym. The casual surroundings (the gym, a concrete walk-up in a modest barrio a few blocks off the beach, with a hair stylist as a neighbor) have the feel of a community center. The ring takes up half the main level; upstairs, on a small mezzanine, a few kids were training, girls as well as boys. I walked over and sat next to Rafael Arias, who is the swim trainer for the Zaparis. Photographer Matt Mawson – who brought me to the gym – and I were hoping to swing by the Playa Norte swim club to see Zurdo train there. Arias is a fit man. At 71, he is a good example of the benefits of his methods. He tells me he has a diverse background in sport, everything from soccer to rowing. “But what is the specific advantage of the ocean training?” I ask. I think of the intensity of this training – and of how it isn’t possible in places like Los Angeles, where the water is too cold, or in Germany, where Abraham trains. A few days later, the sun having just risen, Mawson and I arrive at the beach. The Zapari team is already there, including Alan “Explosivo” Herrera, who, unfortunately, would lose the lightweight undercard to Alejandro Luna a week later, on January 23, at the Staples Center in Los Angeles. I approach Jesus Zapari, who is on a small black bike with extended handlebars. 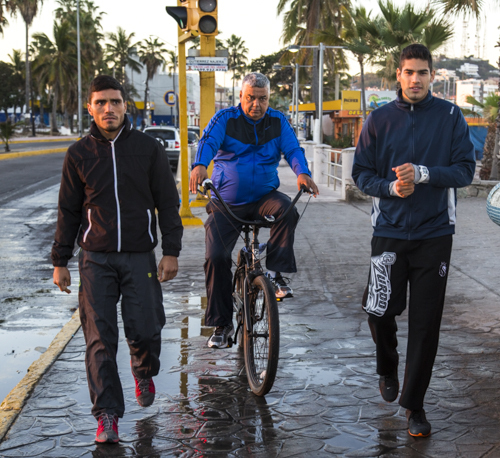 In Mazatlán, the ocean walkway – called the Malecón – extends for miles along the city beach, and this is where Herrera and Ramirez go for their morning runs, with Zapari cycling alongside. “Is it okay if I am here?” I ask. I am still worried about the ‘spy’ business. He has a point. He doesn’t know me. I could be a spy, getting the lowdown on their strategy, for all he knows – and that would be awful. I name the run-down hotel where I reside when in Mazatlán. I walk over and chat with Gilberto Ramirez. He has an open, kindly face. I ask him a few questions. In a soft-spoken, understated manner, he gives me a quick bio – boilerplate stuff, much of it already known. The irony is that, after having visited the Zapari gym, it is clear to me that it is a much safer place than the streets. 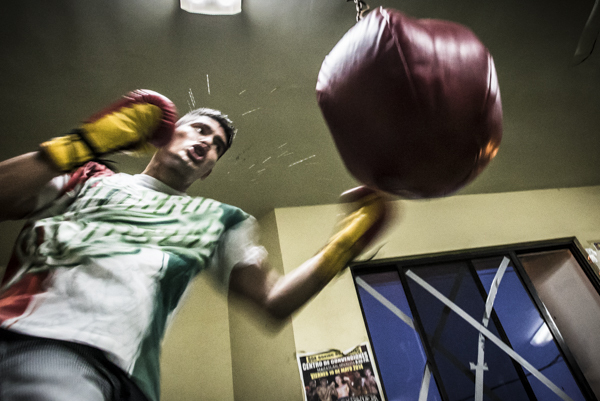 If you are a parent of a wild child in Mexico – boy or girl – putting them into a boxing gym might be your best bet. There is a smooth determination that pervades the Zaparis, as well as Ramirez. These are “Mazatlecos” – people from Mazatlán – and they have the reserved strength that comes from a lifetime of having survived and even embraced adversity. I mention this to Hector Zapari. I stare at him with some incredulity. A quemadura is a “burner”, a Portuguese man o' war. They have long stinging tentacles. I have been hit three times by quemaduras while swimming in Mazatlán. Once, the tentacles, which are long, strong and gelatinous, were wrapped around my neck, and it felt like I was being strangled in a chemical fire. Which is to say that, after being hit, a normal person does not “keep going”, in part because Portuguese man o' war float in large groups. To swim on through them would seem – to me at least – utter madness. “Of course I am serious,” he says matter-of-factly. 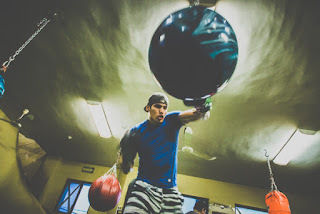 What is perhaps strange for the Zaparis is where they find themselves in history: a small-town team training the highest weight class challenge ever by a Mexican fighter. On the beach in Mazatlán they are ignored equally by middle-class Mexican ladies doing Zumba and sun burnt gringos walking off their hangovers. But they appear content to carry the torch. Ramirez will, to some extent, be fighting in front of a home-town crowd when he meets Abraham at the MGM Grand in Las Vegas on April 9. That will be a boost. And, judging by the feeling in Mazatlán, the outer calmness shown by the Zaparis and Zurdo is more likely an indication of their intensity. Interesting, thanks for this. What an opportunity for him. I'll be watching the outcome.